Oak trees (Quercus or Lithocarpus) belong to the beech family and are broad-leaved, deciduous trees. Oak trees are considered one of the best shade trees and produce fruit in the form of acorns. 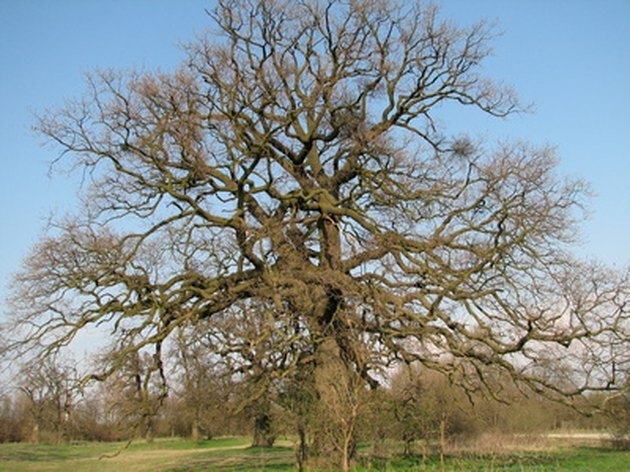 They reach a mature height of 50 to 70 feet and the majority of oak trees adapt well to a wide range of soil conditions. Oak trees are generally free from pests and disease. Though galls often appear on the leaves and stems, they are not harmful to the tree. Oaks trees have a long life span. Oak tree are hardy trees with very long lives and can live to 200 years or even more. One of the oldest oak trees on record was in Talbot County, Maryland and was believed to be over 400 years old. The tree measured 32 feet in diameter, 105 feet tall, and has a crown spread of 158 feet. The tree, however, could not withstand a violent thunderstorm in 2002. A certified old oak is named the Seven Sisters Oak in Louisiana with an estimated age of 1,000 years. The tree measures 37 feet in diameter with a crown spread of 150 feet. Mature oak trees can draw nearly 50 or more gallons of water on a daily basis through their root system. Consequently, they need to be well watered and do not have to be planted in well-draining sites. Oak trees have very extensive taproots and are able to compensate for any water shortages by seeking water from underground sources. Oak trees produce acorns profusely from the average age of 20. There are certain instances in which the oak does not start to produce acorns until it is 50 years old. However, once they start they will produce thousands of acorns during the fall and the amount will increase every year. Acorn production is supported by tree health and protection from the later spring frosts that can blight the flowers and hence affect ample acorn production.